As Virgil Exner said, "The public doesn't really know what it likes until it sees the product. If you could figure out just what the public wanted ahead of time in this business, you might sleep a little easier—but it wouldn't be anywhere near as much fun." In order to explore just what the public might want, Exner embarked on an intense program of futuristic concept cars that soon became highlights of the feverish 1950s American auto scene. 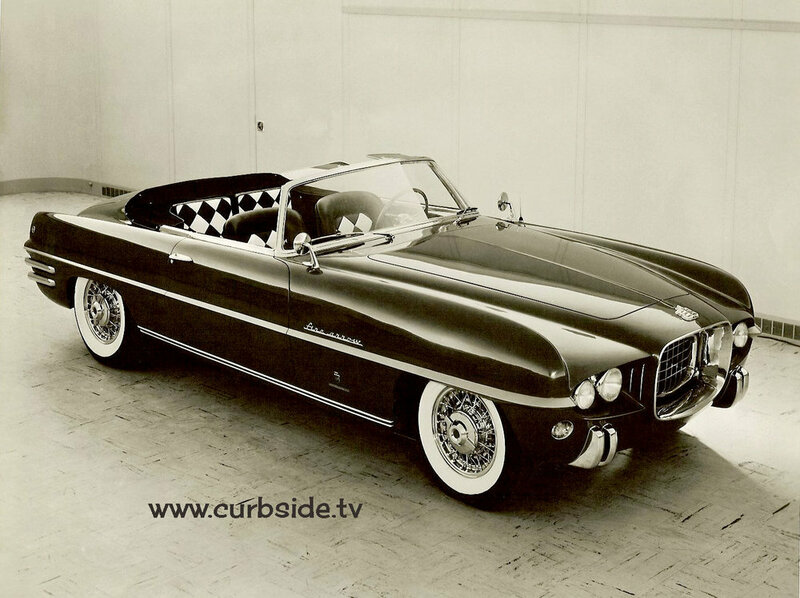 After stints as chief stylist for GM's Pontiac division, and chief styling engineer for Studebaker at the age of 29, Exner was hired to develop Chrysler’s advance styling department in 1950. His work there soon proved so successful, he was promoted to helm the company’s nascent design department, a barely there part of Chrysler he proceded to develop to the point it was a major influence on automobile design generally. 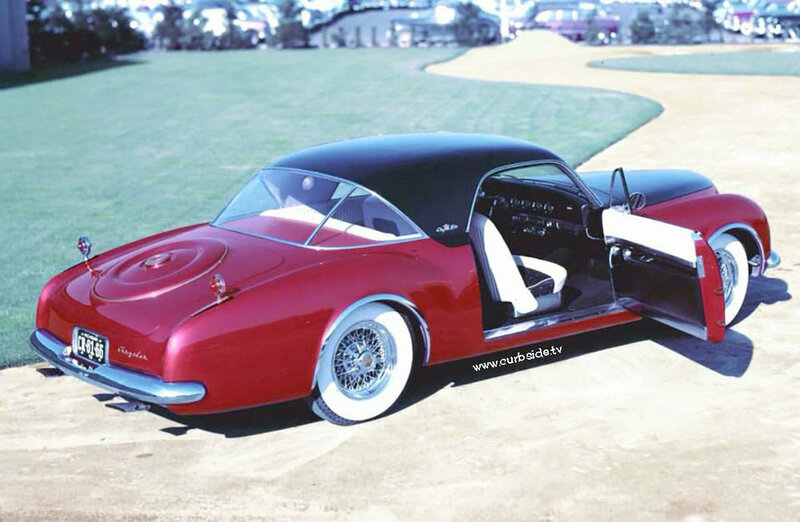 Starting with the sporting 1951 Chrysler K-310, Exner embarked on a nonstop concept car program only eclipsed by Harley Earl’s efforts at General Motors. Calling his efforts, “idea cars,” Exner produced a series of dreamboats that rolled into the spotlights to dazzle the public with excitement on wheels. Reflecting his love of sophisticated European design, Exner’s dream cars were, for the most part, drivable, real-world cars, advanced enough to excite the public, but practical enough to be produced. This set him apart from the wild blue sky space coupe concepts being turned out at GM and Ford. 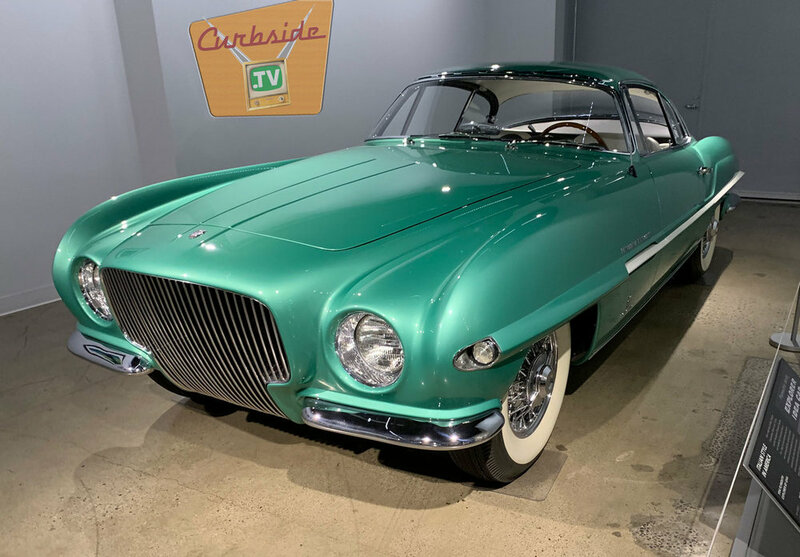 He contracted with coachbuilder Ghia of Italy to build his idea cars as the Italians were highly skilled and much less expensive than Detroit coachbuilders. 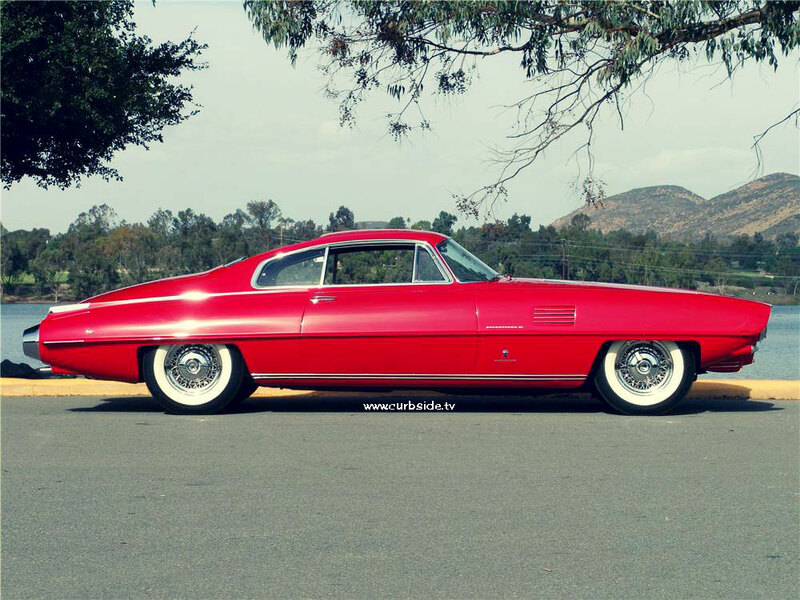 His 1954 Dodge Firearrow proved so easy to produce that a Detroit industrialist built and sold over a hundred examples he called Dual-Ghias. 1953 Chrysler D’ Elegance: Stunning, Euro-styled sports coupe, it lent its lines to Volkswagen’s classic Karmann-Ghia. The 1955 Flight Sweep I/Flight Sweep II: A convertible and a hardtop designed to explore prominent tailfins, a styling theme the company adopted for its revolutionary 1957 Forward Look lineup. 1955 Chrysler Falcon: Exner’s answer to the first Corvette and Thunderbird, a two-seat, long hood-short deck sport convertible noted for its "pure automobile" aspects including a prominent radiator grille and exposed side exhaust pipes. The Falcon's egg crate grille was later adapted for the 1957-59 Chrysler 300s, while its side-mounted exhausts were adopted by the Dodge Viper. 1956 Plymouth Plainsman: A rare station wagon concept that included powered folding seats and a motorized retractable step for entering its rear compartment. 1957 Chrysler Norseman: A radical fastback coupe that dispensed with windshield pillars altogether, the Italian-built Norseman went down with the ship when the Andrea Dorea sunk off New Foundland, never to be seen. 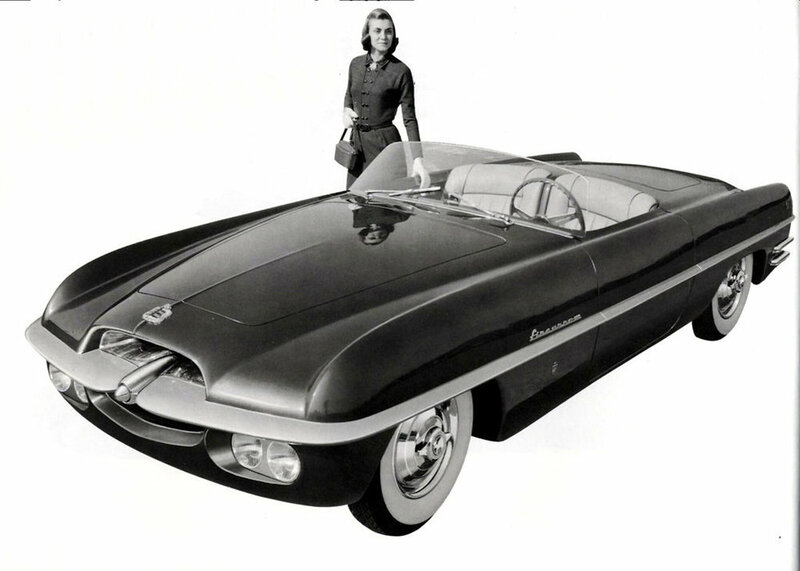 1960 XNR: Exner developed a compact two-seat roadster to explore asymmetrical, driver-oriented design themes with sculptural fender blades and Slant-6 power. 1961 TurboFlite - The radical two-door coupe with a retractable flight cockpit-style roof canopy featured a prominent winged spoiler high over the rear deck. 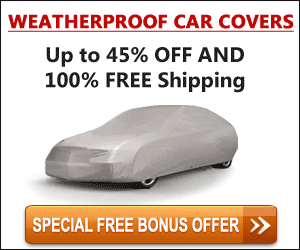 This aerodynamic feature would later be used successfully by the 1969-70 Dodge Charger Daytona and Plymouth Road Runner Superbird in NASCAR competition. 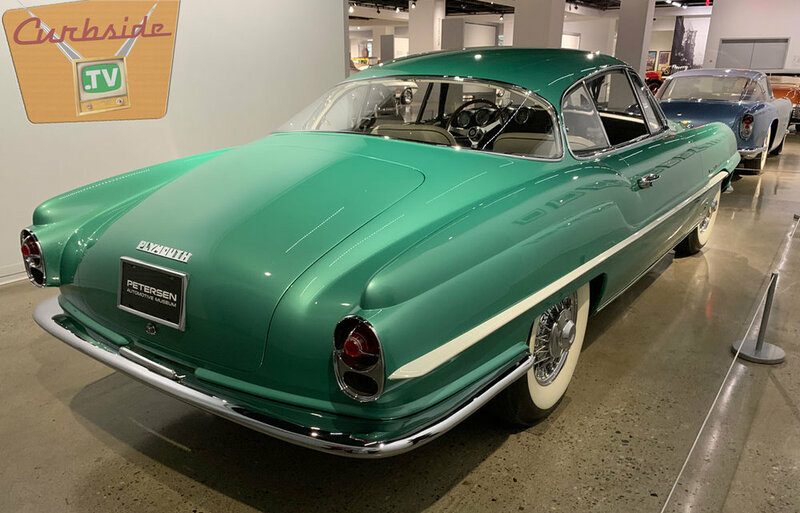 It was especially impressive that, as the smallest of Detroit’s Big Three automakers, Exner was still able to lead Chrysler to great heights, exploring the future through a stunning series of mid 20th Century concept cars.